Here is a great article from the Australian Triathlon Magazine with 8 tips for older triathletes. These are tips I follow. 8 Training Tips for Older Triathletes. As the triathlon race season comes to an end in the Northern Hemisphere here are some resources to assist you with your season in review. Now that Triathlon Season is Ending – Here are some great ideas on what to do as the triathlon season ends, and before you get right into next season, from Active.com. Tips for the triathlon off-season – This video from Enduranceworks gives you 3 tips for the triathlon off-season. Review your Season - Kevin over at TriSwimcoach provides a great structured outline for evaluating your season and planning for the next. Although focused on swimming, this equally relevant for triathletes. Quick Shoulder Exercise – The shoulders are typically neglected when it comes to strength training by triathletes. This quick 1 minute video offers a great exercise. There are many other one minute videos focused on training for triathletes. Quick Set Friday: Pre-Race Tune-Up – Sara McLarety has a wonderful site with hundreds of triathlon workouts. This one is a pre-race swim workout. Xlab Kompact Between the Arms "BTA" Hydration System – I switched over the weekend to this to BTA system. This is a simple cage that firmly attaches to your aerobars and holds any water bottle. Secure and much easier than the Speedfil I had with the straw. I constantly found myself trying to find the straw with my mouth so this works much better. This week’s Triathlon Tuesday focuses on the Interwebs – websites I follow and enjoy. These sites are in my RSS feed subscription and I enjoy this new content daily. The 5K Runner – Focuses content on triathlons, duathlons, training and tech. Good opinionated posts on gear. DC Rainmaker – This is the go-to site for detailed triathlon-related product reviews. Ray Maker is the guy behind DC Rainmaker and does an excellent job of breaking down the gear and technology around triathlon - must visit site for gear reviews. Beginner Triathlete – Focuses on the new triathlete with training plans and information to get you up to speed quickly. Great resource for the new age-group triathlete focused on training. Triathlete Magazine – The mother ship of all things triathlon. The web presence for Triathlete Magazine - Gear reviews, training and injury tips. All around great resource for the sport. 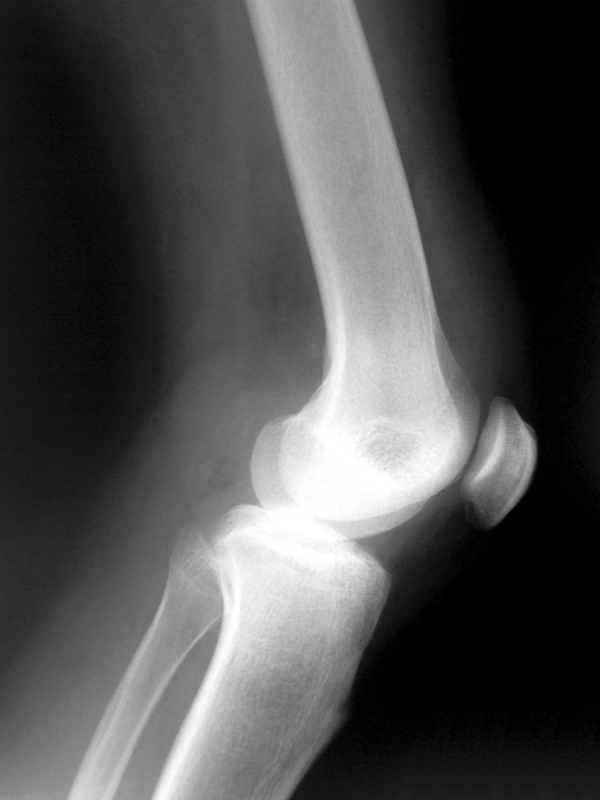 Endurance Nerd – Triathlon training and gear from a physical therapist’s view. Good content on training. Other sites are on your go-to list? Add them below in the comments. This weekend I enjoyed a weekend away from home with the family. This driving vacation offered a lot towards my training. I was able to ride a completely different course. A fun loop around Stony Creek Metropark was enjoyable, challenging and a great change of pace. I was able to get a strength training workout in with the equipment at the house we were staying at. Different equipment allowed me to change up my strength routine and try something new. I was able to challenge different muscle groups. I was also able to get in a nice leisure recovery ride with the family as we all brought our bikes. It was fun to see a Tri-bike, a racing bike and a beach cruiser all sharing space on the hitch rack. I was able to practice packing for an out-of-town race (which I have coming up in a few weeks at the Nautica Malibu Triathlon). This try run was a great way to see how I was going to transport my nutrition, what gear I really needed, and what tools I needed to bring. Even down to the clothing I needed. I forgot nothing and as always relied upon my checklists. Practice packing and preparing for an out of town event. It was a great way to jumpstart my training and to enjoy a long weekend from home. I hope you get to do the same during your training. How Running Power Meters Work –From the trainingpeaks.com blog explains one of the new developments in running – the power meter. We are all familiar with the cycling power meter here is a great primer on the running version. Speedfil between the arms hydration system – I have been using the Speedfil Z4+ which has the cage, water bottle and hydration lid all included. This system gives you the ability to use any standard specialized-type water bottles. With the included velcro strap the bottle is help tight and the internal washer keeps the lid leak proof. Garmin Quick Release for 920xt- I mentioned this in a previous Triathlon Tuesday post. This attaches your Garmin 920XT to the Speedfil Z4+. You remove your band from the watch and install the quick release bracket to your bands. After that, the watch / computer head snaps on this attachment for your wrist and then on to the Speedily Z4. Great way to get your computer on your bike. The attachment is secure and there is a positive snap when it is properly secured. Run with Power by Jim Vance – I’m enjoying this book. I need to improve the weakest part of my triathlon which is the run. I like Jim’s view on metrics, especially power in Triathlon 2.0. This week’s post on why I think older triathlete’s contribute to the sport. In case you missed it I make the case for why midlife triathletes contribute positively to the sport, check it out. As a 53-year-old triathlete I consider myself a great match for the sport of triathlon. Here are six areas where senior triathletes contribute and enhance the sport. At this point in my career and life, I have a nice home, cars, and most things that I need. I have a higher percentage of disposable income that I dedicate towards my gear and training. I understand and recognize value and I’m willing to pay for value. The adage “the cheap man pays twice” is something I believe in so I constantly look for quality and value first then price. My experience is that you end up spending less in the end if you are will to invest in quality. At my age I might be buying equipment that may last the rest of our triathlon career. The best way for me to be successful is to develop the necessary skills and technique, then work on speed and endurance. This is why I am a firm believer in formal coaching. The Masters Swim team I am a member of has been extremely valuable in my swim success and improvement. And cost of a Masters Swimming License and the Y membership have been well worth the cost. I also like to make the triathlon race experience more than just the race. I enjoy making a weekend out of it and am willing to travel for the experience. This year my A race is the Nautica Malibu Triathlon out in California. I have children that I have brought into the sport. Making the training and racing a togetherness thing has allowed me to bring younger athletes into the sport that would probably not have gotten into the sport. They are a lot younger than the 53-year Dad that just discovered the sport. Partially funding their hobby hasn’t hurt; and I hope this gets them on the right path with quality gear and dedication. I am working to bring the youngsters into the sport. I am serious and focused on the sport. My generation understands the benefit of hard sustained work and the benefit of focusing this energy. I am goal-driven and display the traits that are necessary for goal achievement. I plan, set big goals and set my sights on bucket list races and achievements. I show people how to succeed. I bring the goal attainment success I’ve experienced in other parts of my life into the sport. Setting and achieving goals is not an overnight activity and I hope others pick this up by watching me. I am not easily distracted and understand the time commitment necessary for success. I am not out jumping from thing to thing; I know what I want and am dedicated to mastering the sport. With all this focus and dedication, I’m a great example of the 5:00 am training plan. My days are busy so I’m dedicated to getting my workouts out of the way early allowing the rest of my day to progress as planned. I plan most everything. I am a great ambassador for the sport. The fact that I have this blog is evident. I am active on Facebook and Twitter and really share what I learn and my enthusiasm for the sport. I also use it to support the younger athletes as they chase and achieve their goals. I enjoy the camaraderie of the sport from my master’s swim team to the open water folks I swim with to the guys I race with. I really enjoy making this individual sport a group event. I enjoy learning about the sport through books, YouTube, podcasts and magazines. I embrace the old and new media to get the knowledge I need. I am also busy with family and my career. I don’t have time to waste on unproven training techniques and equipment. I may be more conservative in this regard but I focus on high-quality proven equipment and training methodologies. This helps drive efficiency in my training and approach to the sport. This focus also requires that I am efficient with my training. Each workout has a specific purpose and is planned out in every detail. Maybe too much but I know when I have completed a training workout if I was on plan or not. I don’t have a lot of junk miles. This may sound funny or ironic but I view triathlon as something I can do for the rest of my life. Which is probably thirty plus years. That gives me a great long-term view on continually improving. I want to be efficient in developing my skills and technique but I am long-term as it relates to speed and endurance. I’m not training for the next Olympics or a college scholarship. I am working out and training for the sport and me not the mirror. Over time that will take care of itself. I’m not looking for a magic bullet but rather recognize expertise and am willing to listen to it, regardless of the provider’s age. Most of them are younger than me anyways. I describe myself and other 50+year old triathletes I know as having child-like enthusiasm with adult checkbooks. We’re good for the sport. Here is this week’s edition. 5 Ways For Beginner Triathletes to Get Faster – From the Trainingpeaks.com blog. As a beginning triathlete I found these practical tips useful. I will be reviewing these tips as I go through my year in review and plan for next year. Nautica Malibu Triathlon - All of my races have been in Ohio. I decided to pick an A race that was completely different. This will allow me to race with my older boys and completely get out of my comfort zone. Open water ocean swim sure isn’t the state park! Are you getting out of your comfort zone? Kinetic Cyclone Trainer - Here in the Midwest it is tough to ride outside year-round. I rely on this wind resistance trainer for early morning and poor weather rides. I can quickly put my bike on and off and is extremely stable. It does not have a power meter or electronic resistance adjustment. Stages Power Meter – I just installed this power meter on my Cervelo and I’m enjoying the data. I will have a detailed review later on this power meter but for less than $600 this single side meter is working for me. The power and cadence data has been helpful for me as I train for my last race of 2016. This week’s installment is all wet. This is the gear I use both in the pool and open water. Blueseventy Men's Reaction Sleeveless Wetsuit – In the Midwest most races through June are wetsuit legal. I picked up the wetsuit from our team’s sponsoring store Up and Running. At tip – look for a local wetsuit day. This is a great opportunity to try it in the water before you buy it. TYR Special OPS 2.0 transition goggles - These goggles have polarized lenses that adjust to the sunlight. They work equally well in the pool and open water. I have settled on these to have one pair that I can dial in the fit. I do carry two other pair just in case. TYR SPORT EBP Burner Fin – Fins are a critical tool for our swim workouts. A must-have training tool. This fin fits extremely well and is just the right length for my swim development. TYR 2.0 Ultralite Snorkel – A quality swim snorkel that fits well around the head and is just all enough to function in the pool. Another tool used weekly. Also comes with two air restrictors; although I rarely use them. Speedo Team Pull Buoy – This tool allows you to focus on your stroke, and body tautness. We use the swim buoy a lot during warmups. Typically used with swim paddles. TYR Catalyst Contour Training Paddles I use these along with the pull buoy to focus on stroke form while stabilizing my lower body and eliminating the kick. Finis Kick Board – Any kickboard will work. This is the one I chose. Workhorse for working on your kick and elevating your heart rate during warm-ups. Equinox Nylon Mesh Stuff Sack 23 x 36 – This bag is big enough to carry all my gear to the gym or lake. The mesh is critical to allow my gear to air dry. Tip – buy bigger than you think you need. I am new to triathlon and getting into the sport past 50 has been interesting. I started out this year in the sport with the road bike I used back in the ‘90’s a Miyata 914. A sold bike with Shimano Ultegra 600. I did my first two sprint distance races with the normal setup and then added Redshift aerobars for the last sprint race. I am really enjoyed triathlon so I set out to upgrade my bike. I noticed that this time of year (July) bikes started to go on sale. I suspect the dealers are moving out inventory so that new models can come in. Looks like middle to late summer (at least in the Northern Hemisphere) is the time to buy a new bike. Here is how I went from my Miyata 914 to a new Cervelo P2. New bikes can quickly get up into the $5,000+ range. I set my budget at $3,000. I felt $3,000 would get me a bike I wouldn’t outgrow or outperform. I don’t make my living at triathlon, other than a few tee shirts I’ll earn $0 dollars off my racing. However, at 53 I wanted this to be close to the last bike I needed. I wanted to spend enough that I wouldn’t “run out of bike”. I am a firm believer in “the cheap man pays twice”. If you try and go too cheap you end up having to buy again quickly and if you saved a little more money and combined that with what you spent on the cheap bike you would have a great bike and would probably have spent much less in the end. I have a road bike that works and I can use on group rides and poor weather training. Essentially I already have a functioning road bike. I do not plan on doing any road racing so I have no need to upgrade my road bike at this time. Training on the old heavier road bike would help with my strength and endurance. The big difference between a road and triathlon / Time trial bike is the frame geometry. What does that mean? With a triathlon bike you are positioned more forward over the bottom bracket than on a road bike. This allows you to get in the aero position more comfortably. A triathlon bike is designed to be ridden in the aero position while a road bike is designed to be ridden in various positions. My focus is on triathlons and I wanted the right tool for the right job. Decision - dedicated triathlon bike. As you would expect, as you move up within a Company’s component line the price of the bike goes up. You typically can get the same frame built out with different component groups. A bike with Shimano 105 is less expensive than Ultegra…than Dura Ace. When I purchased my road bike from International Bike Shop in Bellbrook Ohio, in 1990 (it is still a thriving store) I’ll never forget the advice the owner gave me. He said you should always buy the best frame you can afford because you can upgrade the components later. I upgraded the group set, the wheels, handlebars, pedals, basically everything on the Miyata. On my new bike I wanted something with Shimano components. I didn’t need Dura Ace right off the bat, but wanted Shimano. Also within the Shimano line essentially everything is compatible outside of the electronic shifting, so you can upgrade individual components through their line from 105 – Ultegra – Dura Ace. What you get when you go up within a company’s component line is reduced weight and some improved quality. I can lose pounds off the “engine” for free or loose ounces off the bike for $’s. I’m on the free weight reduction plan right now. From a frame perspective I wanted carbon fiber. I believe all the major triathlon bikes are carbon these days. The combination of being light and strong is key. Decision – Buy the best quality frame I could afford with Shimano 105 components. First thing I did was see what bikes friends I trained with were using. I found this extremely valuable as you generally get insight into their thought process for a typical age-grouper. Just keep in mind to have a bit of skepticism as people will not want to admit they made a bad decision. This was extremely helpful. Best triathlon / time trial bikes under $3,000, best triathlon frames, reviews each major brand. Typically, I saw the Cervelo brand on the lists. I looked at consumer rankings for brands. I typically saw Cervelo towards the top. I also searched for what brands had the most complaints or issues. Although I wanted to be careful with this as typically people are more apt to complain when they aren’t happy vs. Posting when they are happy. I didn’t care too much about what the pros were riding. They have sponsors I don’t. Which means they get free bikes I don’t. At this point the typical names you recognize came to top of the list; Felt, Cervelo, Diamondback, Quintana Roo. With those manufacturers I don’t think you can get a bad bike. The quality, workmanship and service behind these bikes is there. You can buy a bike on-line. However, I want a local dealer that knows the bike, has a relationship with the brand and can service and answer questions for me. After talking with my training friends, researching on-line for quality and customer views / reviews I then researched what brands were available locally. In the Middle Ohio that included Dayton, Cincinnati and Columbus. This helped narrow down my selection a bit. Cervelo was a brand well represented in the region. One thing I also did was search my company’s discount website to see if there were any bike discounts. This is something to not overlook as companies are always trying to find ways to improve their employees’ health (read- reduce health care costs) and cycling sure does that. My company actually offered a Diamondback discount through an on-line portal. The most important aspect for me was fit and feel. I knew any current triathlon bike I got on was going to feel so much better than my twenty-six-year-old road bike. Proper fit is critical on a triathlon bike. On a road bike you have a variety of contact points with the bike; you can ride in the drops, on the brake hoods, on the upper bars. All these positions change how you are positioned on the bike and affect how the bike is fitted to you. On a triathlon bike you essentially have 2 contact points with the bike. In the horns and in the aerobar position. This makes fit critical as you need to be comfortable in the aerobar position. This allows you to dial in fit as you know what position you will be riding in. With locally supported bikes identified, and the dealers I went into the shop for a test ride and to discuss the individual brands. For me that was a trip up to Logik on their anniversary sale weekend. I discussed the various bikes they carried including Felt, Cervelo. I rode the Cervelo and Felt. I really felt great on the Cervelo. In discussing the Cervelo with the guys there I understood that the P2 and P3 were the same frame. The P3 has an upgraded fork and cockpit. The rest was identical. This came at a $1,000 price difference. I discussed sizing and fit with the guys and settled on the 56 cm bike. I decided on a budget, did my research both in person and on-line and finally rode the bikes that fit my budget. Key – Don’t ride a $5,000 bike when you have a $3,000 budget!!! In the end I am happy with my black and white Cervelo P2 with Shimano 105 group on it. This week’s triathlon gear and training and goodies. Yoga for Triathletes by Jennifer Alexander CD - Great warm down yoga routine for after workouts. Really focusses on the lower back and legs. Awesome way to cool down and stretch out. She also has a full one-hour yoga routine on the CD. Well worth the $25. I use this regularly to try and keep my lower body flexible. Trainingpeaks.com – This is the go-to triathlon and endurance sport training log. I have my Garmin account automatically linked to my trainingpeaks.com account so that everything is synced up. They offer syncing for numerous devices. If you have a coach, you can log your coach in and they can review your workout data. StretchRite Stretching Strap -This strap sits in my home office and I use it daily. A quick way to easily stretch your hamstrings. As someone over 50 I am focused on, and spend a lot of time, stretching out and trying to stay flexible. This is a key tool I use daily. The One-Hour Bike and Run Race Preparation Workout from Triathlete and coach Mike Ricci, owner of D3 Multisport -This workout is designed for the Sprint or Olympic distance triathlete that wants a focused time efficient workout. Mike gets you through a great bike and run workout in an hour. Thule 9029XT Hitch Mounted Four-Bike Rack -This hitch mounted rack comes in a four and two bike option. I have the four bike option. This is a heavy, solid rack that includes sway straps, folding arms and the ability to fold the rack down to allow access to the back of your vehicle. This rack also installs with one bolt which although extremely secure, allows for removal in less than a minute. Matt’s book focusing on training. He builds on his training philosophy of four equal pillars of Training, Recovery, Nutrition and Strength. He has specific training plans and approaches for each pillar. This book is for the true beginner. It starts with all the basic information you need to get started successfully. Will breaks down the swim, run and bike along with all the gear and training philosophies. Training Article Strength Training Article The One Hour Workout for Speed and Power - I find that dedicated, focused time for strength training is hard when you are spending so much time training the run, cycle and swim. Dedicated strength training is critical and here is a one-hour session I found that really pushes me. Triathlon Heart Rate Monitor – gathers heart rate in the water and then transfers when out of the water. It does not provide real time heart rate monitoring. Quarter Turn Bike Mount Used to mount the computer without the strap onto a bike mount. I sue this on top of my between the arms water bottle mount. You don't need this for the bicycle mount kit below. Bike Speed Sensor and Cadence Sensor - This is needed if you want to use your bike on a trainer and want to track speed, distance and cadence. Garmin Forerunner Bicycle Mount Kit Allows you to mount your watch, with strap, to your bike. Foam Roller Recovery Tools – I use two different foam rollers for recovery. One is the smooth 36-inch roller and the other is the intense 12 inch rumble roller that really gives a deep message. Foam rolling really help loosen my legs and back. I foam roll regularly. Here is a post I wrote on foam rolling. I am a beginner triathlete so I spend a lot of time researching, learning and training. I benefit from all work others have done sharing lessons learned, product reviews and resources. There’s a lot out there. I am putting together a weekly summary of things I have discovered, experienced myself, bought etc. Every Tuesday I will publish a brief post on what I discovered, bought, experienced in the hopes of helping on you this triathlon journey. This book distills down all the training and racing data you collect allowing you to efficiently train and race. A great resource to help design and specify a training and racing plan geared towards your strengths, weaknesses and goals. Coach Gerry Rodrigues and pro triathlete Jim Lubinski host this regular podcast dedicated to open water swimming. With regular 30 minute podcasts Gerry and Jim condense the key information and workouts you need to be successful in open water. They help bridge the critical differences between pool and open water swimming. Great information from a proven coach and pro triathlete. Brent Blankner hosts this podcast and as the ITunes summary says “A triathlete's view on training, racing, and living the multisport life. Listen in for insider tips, methods, dealing with family, injury, traveling, and racing.” This is a long podcast from the perspective of the working age grouper as he goes about balancing training, racing, work and family. Good practical information in the regular podcast. Each podcast cast last 2+ hours, and typically have an interview. In triathlons your success usually comes down to training and fueling. I found I was making a lot of fueling mistakes. This article describes four common fueling mistakes we have probably all made. Running is the hardest of the three disciplines for me. I raced road bikes right after college and did swim some in my youth. As a beginner triathlete I am having the hardest time with the run. Be it finding the time, avoiding injuries or enjoying it. I found this article on beginner running tips interesting and helpful. I just finished my first sprint triathlon and here is what I learned and did leading up to the starting gun. Packing List - everything I needed for the race day including pre-race fuel and clothes to wear home from the race. I included 5 categories - General, Swim, Bike, Run and Recovery. Race Focus List - key items I want to remember and focus on for the race. These included the length of my warm-up, that I wanted to go hard on the bike right before the run. This list will change race to race. I also jotted a couple of notes right after the race for things to remember for my next race. You need a gear bag. It doesn’t have to be a new, Ironman branded bag, anything that you can comfortably fit your gear into and preferably with various pockets. I like everything in its place. I used an old cycling bag I have had for 20 years. It worked great and was able to handle by helmet; two sets of shoes and everything except my wetsuit. I literally had my checklist and gear bag together and checked off each item as I packed it in the bag. When the checklist was completed I knew the bag was complete and it went right into the car. I packed my bag race day minus 2 (day-2). That way I had time to pick up any missing items. I recommend that you don’t wait until the day before. In most cases that is too late. With my bag packed and wetsuit in the car (assuming the race is wetsuit eligible) I am off to the race. I headed to the race venue and picked up my packet as early as possible. Going the day before was key for me. You won’t be time crunched to have to get through getting your packet, getting marked, setting up your transition area and allowing enough time for a good through warm-up. Getting there Day-1 allowed me to attend the pre-race briefing; which was extremely valuable for this being my first race. The host shared a couple of tips that I used. I highlight those below. I was able to drive the bike and run courses. I noted the hills during the ride and identified areas where there was gravel around turns and other potholes to avoid. Really gave me confidence I knew what was coming on the run and bike. I studied the transition area and knew exactly how the flow for each transition worked. Once again this eliminated more uncertainty. Understand what buoys are to your right, left where you turn etcetera. Easier to get that down on land rather than in the middle of race. Walk the transition from the swim up to the transition area. Any uneven ground, things to avoid? You have a change to see that. After your Day-1 course review you have reduced some of the uncertainty and stress of the unknown. Now you are ready for Race Morning. First thing I did was to get marked and get your timing chip. For this HFP race they don’t pass out the timing chips until race morning, along with body marking. Remember to place the chip on your LEFT Ankle, as this will ensure it doesn’t get tangled with your bike sprocket. For my first race the transition area was first come first serve. I selected a spot that was right by a large flag. This was key for me being able to see when your transition area is. Remember it is easy to spot your bike coming off the swim, but when you are coming back for T2 after your bike you won’t have your bike as an indicator. Find a large easily viewable landmark to place your transition area. Garbage bag – it rained right up until 15 before the race started so I was able to get my gear set up for the transition and have it laid out inside the large garbage bag. My stuff was organized and dry. When nit stopped raining I was able to quickly get it out the bag and kept it dry. Chalk – If you can’t get next to a landmark for your transition bring some sidewalk chalk or duct tape to put a big mark on the ground signifying your transition area. Your transition area is set, now its time to get the wetsuit on and head to the swim. You can also use duct tape. I didn’t warm up enough and suffered a little on the swim. I learned that I needed to swim enough to feel tired which was the adrenaline burning off. You this by getting fully submerged and do 30 seconds of slow swimming with 15 second bursts. Getting your heart rate up is key and gives you a great warm-up. The colder the water the longer the warm-up. Cold water on your body and face during a race is a recipe for disaster and open water panic. As I continue to workout for my Raleigh 70.3 Ironman I am constantly looking for tools that will improve my preparation. Today I signed up for the annual plan with trainerroad.com. For $99 I get access to all the cycling workouts in their inventory for twelve months. I did purchase at the full retail price and did not receive any discount or review access. As described on the Trainerroad.com website "TrainerRoad connects to your ANT+ or Bluetooth Smart devices to measure your FTP, speed and other metrics, then uses that data to customize over 80 training plans to your personal fitness level"
I will publish an in depth review after I get a few weeks with the tool. I am definitely looking for trainingroad.com to enhance my trainer cycling workouts as we get into winter here in Central Ohio. 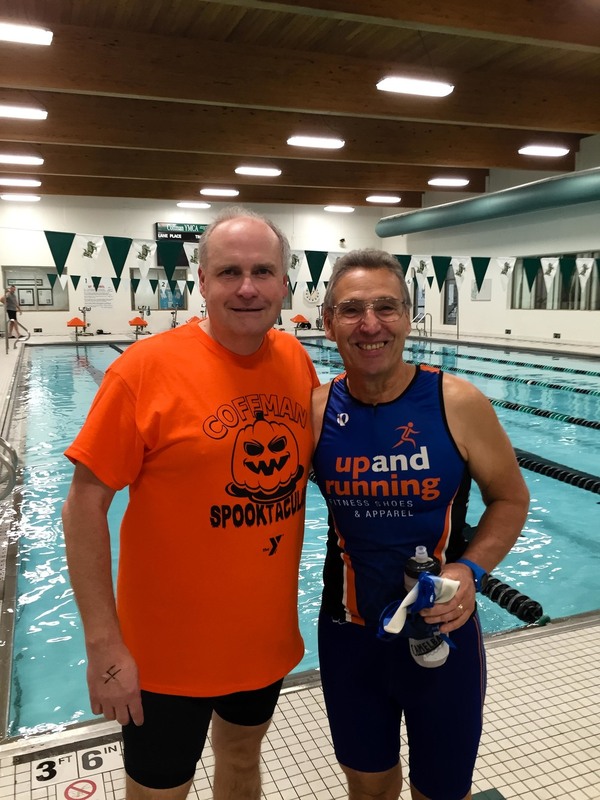 Participated in the Halloween Coffman YMCA Indoor Triathlon today. It was a good time and a great way to spend a Fall morning. The format was a 20 minutes indoor pool swim, 20 stationary spin bicycle ride and 20 minute treadmill run. All with timed 3 minutes transitions in between. They had 4 waves so everyone had their own swim lane. A really good workout and fun event. This was the first year for the event so hopefully the interest and participation will build going forward. My times were what I expected although I struggled on the run as my sore achilles really kept me from running hard. I was happy with my effort in the pool and on the bike. Steve a fellow swimmer with the Up and Running Masters Swim team participated in the event along with a bunch of my work mates. Great time. As you look to get into your off-season training, participating in these short events is a great way to get in a good workout and have a little fun. Everyone who takes up a sport or physical activity has an injury at some point.For me it was ice hockey.Although I'm in a non-contact league, there is still contact and that turned into a meniscus injury.The Doctor says nothing torn so six weeks of non-impact exercise and I should be back on the road.Sounds like my training is on-hold for a month and a half. Not so quick.For me this is a great opportunity to focus on the two disciplines that don't involve impact: swimming and cycling. Off to trainingpeaks.com to set up 6 weeks of training focused on swimming, cycling, and one weekly session of upper body strength training.And for me swimming and cycling are my weakest links so this is a huge opportunity to focus on these two disciplines. This has really helped me as I am in active rehab of my knee and really feel no pain while working out.I have focused on 4 hours of training per week on a 3 - 1 sequence. (3 heavy and 1 recovery).I am easing into this new triathlon thing as I have 34 weeks (as of this post) until my A event the Raleigh 70.3 in June 2016. I am also using the time to work on and refine my annual training plan and enjoying the immersive learning process with my new sporting endeavor.I have been reading and researching training plans as my goal is to really build a good base and then start with a formal training plan 24 weeks out from Raleigh. Even with the injury I am able to increase my fitness and focus on two discipline [I haven't focused on in years.A positive in my book.Have you had any experiences like this?